Western Washington's Premier Soaring Club! Joe Patton has been one of our more energetic and adventurous club members who won everybody over with his outgoing and engaging personality. He pursued a variety of interests, from sailing and bicycling to mountaineering, but his favorite was soaring. He was known as "Java Joe" in the club for his enthusiasm and coffee-toting during his service as secretary of our club. 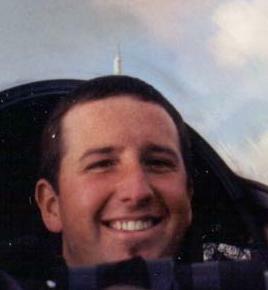 On June 18, 2005 the Board of Directors decided to honor Joe's memory with an achievement recognition that would recognize his outgoing and helpful spirit and serve as a stimulus to other pilots to challenge themselves in cross-country soaring. The Joe Patton Milestone Recognition is given to any Evergreen Soaring pilot who, after June 8, 2005, completes a solo flight originating in Arlington or one of the neighboring airfields that includes a Silver badge distance leg. This is to recognize those who achieve this milestone in their soaring career and to serve as inspiration to others. Such a flight does not have to be documented like an official Silver badge flight; the administrator (the current president of Evergreen Soaring or any designees) will rely largely on the honor system even though pictures, barograms or GPS files are encouraged. If such a flight is an FAI badge or Willy Burhen Cup flight, so much the better. The recognition will consist of a plaque on the wall of our clubhouse that lists the Evergreen Soaring pilots that have accomplished such a flight. The Joe Patton Milestone Recognition is intended to encourage aspiring as well as experienced pilots to develop their flying skills and to expand their range of experience. Let's see this list grow!